Posted in: Elsewhere in Houston, That's our Lege. I fail to see the problem. These unincorporated areas generally have MUD’s, so they have water and sewer service, they have trash service, and many of the subdivisions use some of their savings from not paying city taxes to pay for private security. Most neighborhoods also have HOA’s as well. It seems like they are doing just fine without being enveloped by a city. Have we forgotten what happened to Clear Lake? Has Clear Lake improved since the CoH takeover? What about Kingwood? There’s obviously a reason The Woodlands pays protection money to the CoH in order to NOT be annexed. They are willing to pay blackmail rather than being annexed. If they want to be in an incorporated city, they can ask Houston to annex the area. There’s no need to have a bunch of small incorporated entities around Houston. It’s all about taxes. How do cities get that sweeet swweeeeeeeet tax revenue? The Burbs are doing just fine, thanks. 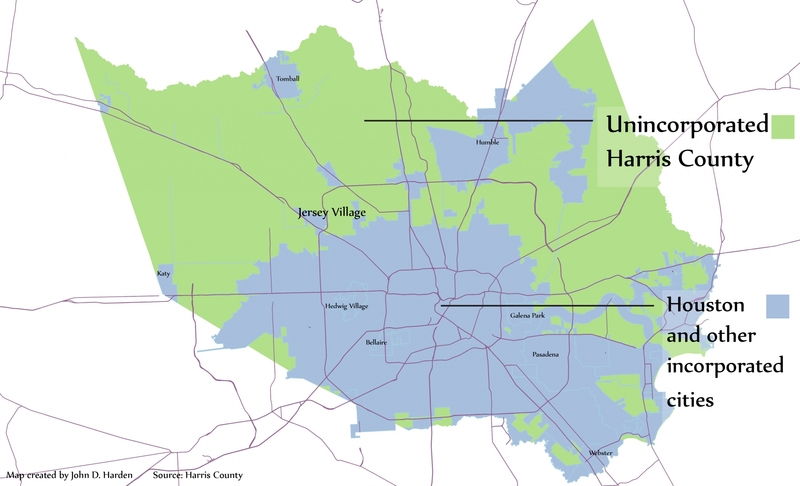 Locally, many of the neighborhoods in unincorporated Harris County are already paying additional sales taxes thanks to the hundreds of MUD’s that agreed to limited purpose annexations with the city of Houston. The terms vary but most of them split the extra funds in half while the city provides virtually no services. Thanks for mentioning the LPAs, Steve. An additional feature is that voters registered within LPAs are qualified to vote in City of Houston elections. The deals also typically contain an agreement by Houston not to annex the MUD for a period of 30 years from the inception date as long as the agreement is in force. The complexity of this situation places it in a realm entirely of its own. Steve can you provide a link where I can verify the information, Many … already paying … hundreds. If you cannot provide a link, where did the data come from? Slight correction to my post: LPA voters aren’t qualified to vote in Houston bond election. Here are two resources on the subject. Voter, it’s my understanding that Houston doesn’t use the process to annex the entire MUD, just the commercial portions of the MUD in most cases, eliminating any voting issues. Friends out west and up north tell me they are still charged the full tax rate on items they have shipped to their homes but do not get to vote in city elections-but I don’t know if that is widespread or not. Manny, sure thing. They started when Mayor Brown was in office and used to be a large part of individual weekly council sessions. Some are with MUDs and others with similar special purpose zones. The city website used to offer a list of each LPA but I cannot quickly find it since the website’s been upgraded. infrastructure it was already providing. this funding to pay for law enforcement contracts. The LPA approach, though, does not include counties. The MUD can’t impose a sales tax, the City can and they split that with the MUDs. 1. Revenue-Districts cannot impose taxes on retail sales, but they can share sales tax revenues with the City which has statutory authority to impose a sales tax. The additional revenue that accrues to the districts can be used in any lawful way to benefit the districts. This revenue is typically used to reduce outstanding debt and to invest in infrastructure. 2. City regulations and ordinances can be extended to the LPA’s. For example, the districts have no authority to control fireworks, and the counties in which districts are located have limited authority to control fireworks. The counties authority is usually associated with a drought designation. As a home-rule city, Houston has broad authority to control fireworks by ordinance. This control can be extended to a district through a LPA and it accompanying SPA. Refer to the Fireworks Ban Enforcement Area map to the map at: http://www.houstontx.gov/fire/news/2010fireworkban/mastermap.pdf. Note that the fireworks bans extend beyond the boundaries of the LPA’s. Mentally place the fireworks ban areas on the spiderwebbing display of LPA’s and immediately questions arise on how the rectangular ban areas are determined. There is a provision of Texas law that allows a municipality to control fireworks 5,000 feet outside the city limits. This law may be the authority under which the patchwork of fireworks bans reaches out beyond the geographical boundaries of the LPA’s. 3. The districts can secure enhanced levels of services from the City. Such services can include animal control, police, fire and emergency medical services. 4. The districts can use the City authority to offer “380 agreements” to potential developers of commercial property. 380 agreements refer to chapter 380 of the Texas Local Government Code. This chapter of the Texas Local Government Code authorizes Texas municipalities, both home-rule and general law municipalities to provide assistance for economic development. These programs must serve the purpose of promoting state or local economic development by stimulating business and commercial activity within the city, the extraterritorial jurisdiction of the city, or an area annexed for limited purposes. Steve, yes, the LPAs are not covering entire MUDs, only significant commercial areas within them. The reports from your friends who are not in an LPA but are being invoiced for sales tax are a red flag that tax is being erroneously charged by online corporations. Very sloppy if it’s happening and could be a cause for legal action (I am not a lawyer). There are more than a few voters in LPAs because they sometimes include hotels and even a few apartments, and it’s not unheard of for folks to register to vote where they work and at private postal boxes inside LPAs. Add “City of Houston” as a modifier to my comment about sales taxes being collected. Anyone can check their residential address on the HCAD website to see if it’s in a City of Houston full annexation (jurisdiction code 061) but that code will not appear in accounts within an LPA. The MUD can’t charge sales tax, but it CAN collect MUD tax, which a relative of mine has to pay. It’s not an insignificant amount. So if the MUD can levy taxes, how would it benefit from a “partnership” with the city? The city gets a cut of the sales tax for being a tax collector, but how do the actual people of the MUD benefit? Seems like they just get screwed out of more money. Bill, he said that the two entities benefited (presumably Houston and each MUD), not the people actually paying the additional sales taxes/”commuter tax” (what they used to call it around the horseshoe of city hall). The city gets a half cent and the MUD gets a half cent, the county gets nothing and the resident gets nothing. The reality is, in most cases at least, that the city provides no real services or benefits, no property taxes being imposed but could benefit if his MUD used the extra money to pay off debt, move forward on needed upgrades, or spent it on something the residents wanted. Voter, I’ll check on that because they were certain they were being taxed the full sales tax rate by everyone, such as Comcast, ATT, Amazon, etc. Steve, While it may not be the case in some of those places, the people that live in the MUDs benefit by lower MUD taxes if the MUD uses the money for paying debt or improvements that would have been taxed. If the MUDs were not benefitting it would be an issue with the state, as much as Republicans hate Houston.